Sleeve gastrectomy is an effective surgical treatment for morbid obesity. The major technical risk of this procedure is staple line dehiscence. Some surgeons are reluctant to place a nasogastric tube (NGT) blindly due to the perceived risk of damage to the staple line. We sought to determine whether such concern was warranted. A porcine tissue model (Animal Technologies, Inc., Tyler, TX) was used. 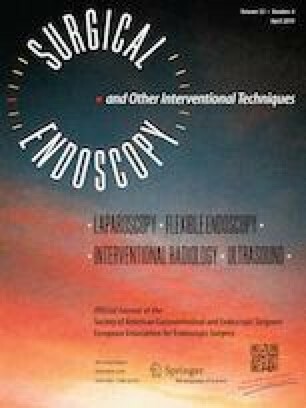 Sleeve gastrectomy was performed using a flexible gastroscope as a guide for the Endo GIA stapler (Covidien, New Haven, CT) in an identical fashion used in our patients. The specimen was then placed in a plastic model of the thorax (VATS Trainers, LLC. Lansing, MI). The NGT was blindly advanced to 55 cm for a total of 50 passes, and to 75 cm for another 50 passes. Endoscopy with water submersion was performed to evaluate for injury or leak. After multiple passes of the NGT, no significant injuries, leaks, or perforations were observed to the gastric model, except for several small petechiae of the gastric mucosa, the largest measuring approximately 3 mm. None were of full thickness or penetrated the mucosa. The staple line showed no evidence of trauma. In this porcine model, blind NGT placement was not associated with significant mucosal injury or any damage to the sleeve gastrectomy staple line. We extend our appreciation to Charles Albertson, Daniel Shovlin, and Sandy Waters for their technical support and expertise. T.F. and M.M. designed the study; T.F., L.N., T.R. and M.M. performed the literature review; T.F., M.M. and M.S. performed the experiment and analyzed the data; T.F., T.R., L.N. and M.M. wrote the manuscript. All authors approved the final version of the manuscript. No extramural funding or grants were used for this project. Resources used were already available within the college. Drs. Fabian, Robinson, Naile, Smith, and McErlean have no conflicts of interest and no financial ties to disclose.